From May 3rd to 5th the 19th IE EXPO - 中国环博会 was held at Shanghai New International Expo Centre (SNIEC). 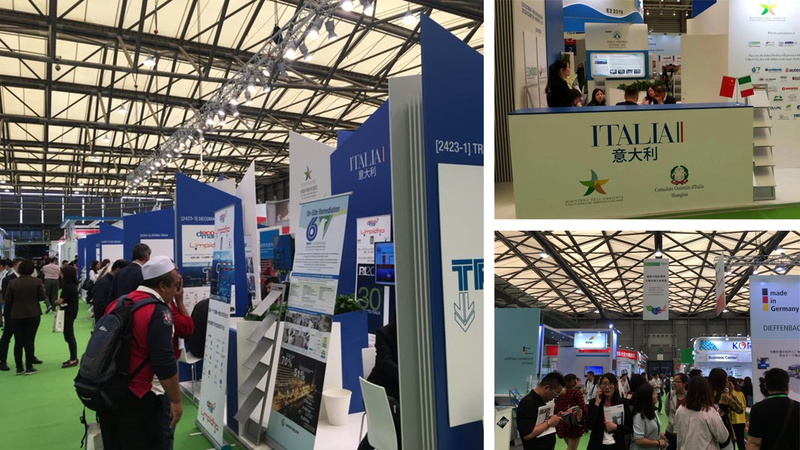 The Italian exhibition pavilion was sponsored by the Italian Ministry of Environment, Land and Sea - in the framework of the Sino-Italian Cooperation Program for Environment Protection - and actively promoted by China-Italy Chamber of Commerce (CICC) through the participation of the Energy and Environment Protection Working Group (EEPWG). The Italian exhibition pavilion aimed at developing the cooperation between China and Italy on environmental protection end green-tech. as well as promoting Italian companies' know-how and technologies in these fields. This edition saw an increasing participation of visitors compared to the previous editions (66.580 visitors) and an outstanding representation of Italy with more than 30 Italian enterprises exhibiting in sectors like Water and Sewage Treatment, Waste Management, Site Remediation, Air Pollution Control and Air Purification. The “SINO-ITALIAN WORKSHOP ON GREEN TECH.” - organized by EEGEX, CTEX, the China Environment Chamber of Commerce (CECC), and promoted by CICC - was held in the afternoon of the opening of the exhibition, providing an insight about tools and strategies for technology transfer between Italy and China, including IP trading and financial services. The session was opened by Ms. Silvia Massimi, Program Manager of Sino-Italian Program for Environmental Protection, and followed by Mr. Zhao Lijun, President of CECC, Mr. Roberto Pagani, Science Councellor of the General Consulate of Italy in Shanghai, with the greetings of Mr. Stefano Beltrame, Italian General Consul in Shanghai, Mr. Guo Ninglin, executive Director of International Cooperation Centre of NDRC - National Development and Reform Commission, Mr. Federico Bullo, President of IVECO China and member of the EEPWG, Ms. Guo Shugui, President of CTEX, and Mr. Simone Padoan, Secretary General of EEGEX. The workshop rundown went on with Cases histories sharing on themes like “Sustainable Urban Logistic” and “Soil and Water remediation in Contaminated Sites” from Italian enterprises and Chinese counterparts, among which also the outstanding Case history of the pilot project for sustainable urbanization in Chongqing realized by IVECO China with the support of China-Italy Chamber of Commerce and EEPWG. The workshop represented an occasion to highlight the commitment of the EEPWG in promoting Italian green enterprises and technologies and strengthening Sino-Italian cooperation on environmental protection with also the support of the brochures “Italian Energy and Environmental Protection Technologies and Management: Advanced, Innovative and Effective Solutions for Cooperation with China” and “Sustainable Urbanisation in China: Italian Expertise and Solutions for a Mutually Beneficial Collaboration”. 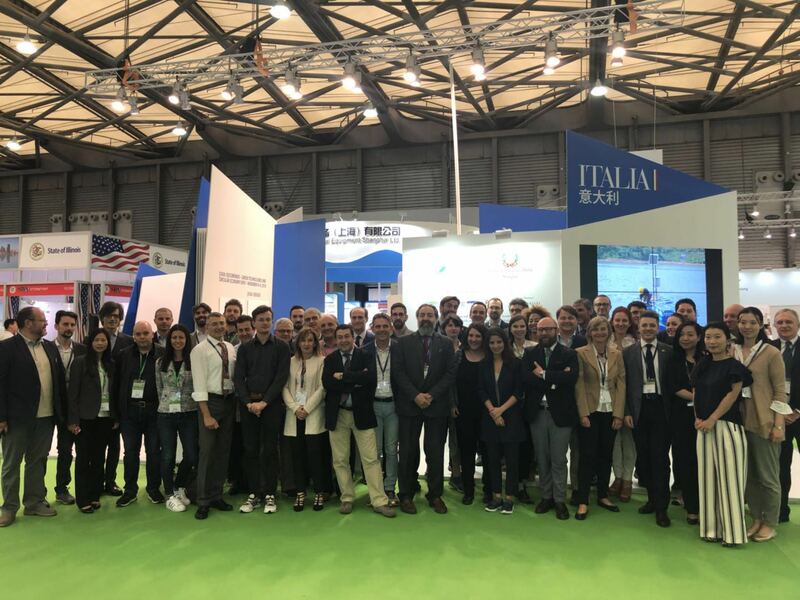 During the three days of the expo, Italian pavilion cooperative partners, EEGEX, CTEX and EUCHAM, led a delegation of Chinese enterprises to have targeted B2B talks with Italian enterprises’ representatives. Moreover, the expo was also an occasion of networking and mutual acknowledgement between EEPWG and Italian companies. 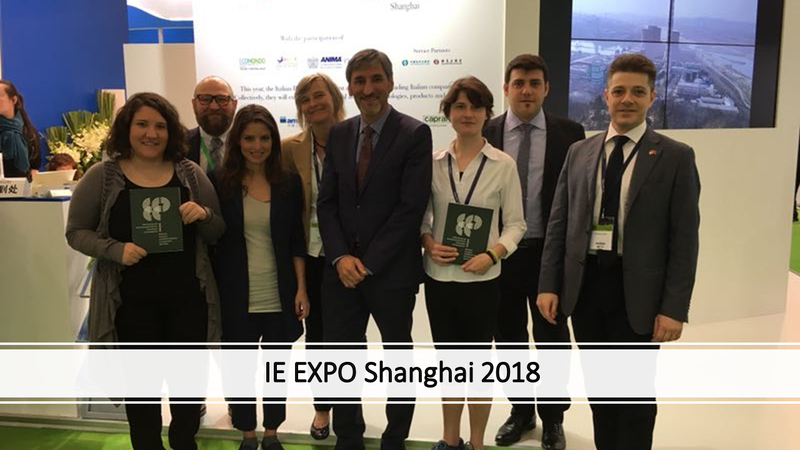 We want to thank all EEPWG companies’ representatives that attended IE EXPO Shanghai 2018.